From its founding by Mary Vardrine McBee in 1909, Ashley Hall has remained faithful to its original mission: To produce educated women who are independent, ethically responsible, and prepared to meet the challenges of society with confidence. This mission is realized in everything we do, from campus traditions to our innovative curricula and teaching philosophy. It inspires both faculty and students to engage in a vitally enriching educational community. From boys 2 years to 5 years and girls 2 years to twelfth grade, our curricula, instructional methods, co-curricular programs, and facilities are designed to foster in all of our students, at every stage of their development, those qualities of mind and character implicit in our mission statement. As the only all-girls’ independent private school in South Carolina, Ashley Hall is uniquely positioned. Our exceptional program is intentionally tailored to the way girls learn best—through collaboration, discussion, and individualized attention. The School’s ongoing stability is derived in large part from a continuity of campus culture rich in tradition and a respect for the past which steadies our stance in the present and enables us to plan for the future with confidence in our ability to, in the words of our school prayer, “know that which is worth knowing, to love that which is worth loving…with true judgment to distinguish things that differ….” Our resolve is further buttressed by our collective dedication to the Ashley Hall Hallmarks, habits of mind and action which all of us at Ashley Hall—students, teachers, staff, parents, and alumnae—strive to cultivate in ourselves: to be intelligent, creative, compassionate, discerning, collaborative, purposeful, and worldly. The Big Sister and Little Sister Program was created to encourage and build relationships among different grade levels. Each fall, sixth graders are paired with kindergartners, and new students are paired with big or little sisters in their respective grades. The girls are usually paired for the duration of their time at Ashley Hall. Several events during the school year highlight these special relationships. Other “sister” associations develop between juniors and seniors and seniors and freshmen. Click here to read more. Beginning in fifth grade, each student becomes a member of either the Purple or White Team. If a student’s mother, grandmother, or sister attended Ashley Hall, she is automatically on that relative’s team. Team assignments for new students are chosen by lot. The goal of each team is to encourage good sportsmanship, teamwork, loyalty, and friendly competition. A student does not contribute to her team solely through athletics; points are accumulated by participation in academic and extracurricular activities as well. The Team Cup is awarded at the end of the year to the team with the most points. Since the School’s boarding days, Fathers’ Morning has been a spring break tradition at Ashley Hall. Borders would eagerly await their fathers, who had come to pick them up for the holiday, and show them around classes while introducing them to friends. Now, Fathers’ Morning is still marked by classroom visits and special programming. From dissecting a squid together in science lab to competing in a relay race on the campus lawn, it’s a special time for both fathers and daughters to spend together on campus. A performance derived from fourteenth-century mystery plays in Chester, England, and a tradition at the School for more than ninety years, The Christmas Play was first directed by Mary Vardrine McBee, the founding Head of School, in 1924. Ashley Hall has carried this tradition into the twenty-first century by making it such a distinctive element of school life here. Each December, in the twilight and intimacy of a beautiful church sanctuary in downtown Charleston, Ashley Hall students parade as angels, jesters, kings, shepherds, and the full cast of the crèche to welcome the holiday season with Ashley Hall’s annual production of The Christmas Play. Click here to read more. Our current Head of School, Jill Muti, carries on Ms. McBee’s dedication to single-gender education and is fully committed to providing young women every possible opportunity to acquire the skills and knowledge they need and desire to become twenty-first century citizens of the world. Beginning in 2004 and over the course of her tenure, Mrs. Muti has overseen the completion of a Master Plan that has transformed the campus as well as the arts and academic curricula of Ashley Hall. The Rivers Library, The Hoshall Science and Math Center, the Dining Commons, and the Elizabeth Rivers Lewine ’54 House for Global Studies are all evidence of Mrs. Muti’s leadership and determination to establish Ashley Hall as a leader in purposeful education for young women. Stewarding this mission and working closely with the Head of School is a Board of Trustees composed of established leaders in education, business, and community service. 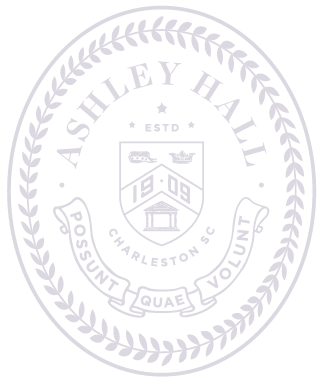 The Board works to ensure that Ashley Hall continues to flourish and exercises its counsel and energies to plan for the school’s immediate and long-range stability. Treasurer | Hugh C. Lane, Jr. Considered one of the most impressive independent school faculties in the Southeast, Ashley Hall’s teaching staff are dedicated to the success of each and every student. Ashley Hall produces many different publications throughout the year to connect with its community. Please click on the button below to view our past pieces. For questions regarding these publications, please contact Paula Harrell, Director of Strategic Marketing and Communications, at harrellp@ashleyhall.org.